In its recent investor meeting in Italy, Fiat Chrysler dropped a number of bombshells, including this one: a new mid-size Ram model is coming for 2022. Is this finally the return of the dearly-departed Dakota? UPDATE: It’s coming to the U.S.! UPDATE: A Ram spokesperson called us to confirm that the pickup is indeed coming to our golden shores. This post has been amended to reflect that. Fiat Chrysler has been out of the mid-size truck game since the 2011 departure of the Dakota, which at that point, had graced American roads with its rugged practicality for nearly 25 years. But recently, Ford hopped back into the segment with the return of the Ranger, and Chevy has been dialing up its Colorado with a diesel engine and a ZR2 off-road package. The slide above is from Fiat Chrysler’s “Capital Markets Day” presentation today, and it shows a veiled “new mid-size/metric ton” Ram truck slated for 2022. The rest of the presentation, which you can read here, is devoid of any other information about the truck. What will it be called? (Ram Dakota?) On which platform will it be based? We have so many questions, but the presentation provides so few answers. I did speak with a Ram rep over the phone. He told me that he’s not sure exactly where the truck will be sold, but that it’s his understanding that the mid-sizer will be available in Mexico and outside of North America, but not in the U.S. It’ll be sold in the U.S., a Ram spokeserson told us. So at this point, it’s unclear. The presentation says mid-size/metric ton, with “metric ton” usually referring to a global vehicle. But is the metric ton vehicle different than the mid-size one? Is the presentation referring to separate trucks for different markets? Who knows. In either case, we should take these types of presentations with a grain of salt. After all, we’re still waiting for the Dodge Dart SRT, and Fiat Chrysler’s presentation does begin with a disclaimer saying “Actual results may differ materially from those expressed in forward-looking statements.” Not to mention, in 2014, we wrote this story, mentioning Fiat Chrysler’s five-year plan which included a new mid-size Ram truck for 2016. While there’s a lot of uncertainty, here, I will say that a mid-size Ram truck seems plausible. The segment is heating up right now, and I have to wonder why Fiat Chrysler—a company whose bread and butter is trucks—would sit on the sidelines. 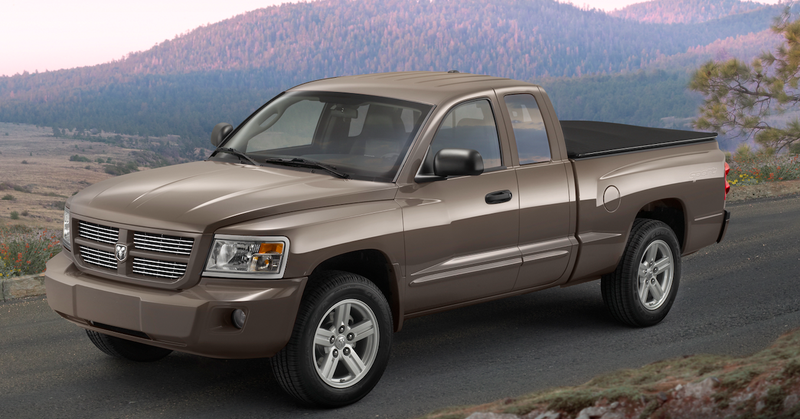 Is Ram Bringing The Dakota Small Pickup Truck Back, On A Fiat Platform?